Wow, it's here in the flesh at Mobile World Congress – Samsung's pico-projector phone. The tiny projector (check out the pics below) will show an image up to 50 inches wide and even though the model we saw had been projecting all day, it surprisingly wasn't too hot. 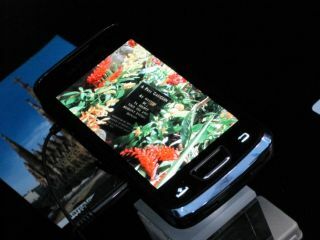 Running Android 2.1 topped out with TouchWiz, the i8520-numbered handset features a 3.7-inch Super AMOLED touchscreen. There's no word on battery life, which we'd imagine would be pretty poor when projecting. You might previously have heard about the Beam under its codename, Halo. Our Samsung demo dude seemed to think we'd be getting it in Europe late in the year, possibly the Autumn. The screen is so bright – the new Wave also has such a screen – and seeing really is believing. However, the six lumens of brightness projection doesn't quite live up to the billing and even in this darkened area it was hard to see the image properly. But in concept the Beam is fantastic and we're obviously just at the start point for pico projection phones. It also sports a 5 megapixel camera and can record 720p video at 30fps. The phone is also capable with DivX and XviD video, so you can take your most recent download with you to watch. There's 16GB of memory on board and a microSD slot, too. As you can see, the model we looked at was firmly screwed down. There's also the usual raft of connectivity – Bluetooth, GPS and Wi-Fi.